This hands-on guide from Oracle Press shows how to fully exploit lesser known but extremely useful SQL and PL/SQL features―and how to effectively use both languages together. 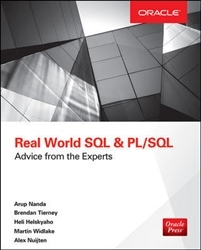 Written by a team of Oracle ACE Directors, Real-World SQL and PL/SQL: Advice from the Experts features best practices, detailed examples, and insider tips that clearly demonstrate how to write, troubleshoot, and implement code for a wide variety of practical applications. The book thoroughly explains underutilized SQL and PL/SQL functions and lays out essential development strategies. Data modeling, advanced analytics, database security, secure coding, and administration are covered in complete detail. Arup Nanda, (New York, United States), Oracle ACE Director, has been working with Oracle database and PL/SQL for 20 years and counting. He has written 6 books, published 500+ articles, presented 300+ sessions, and delivered training seminars in 22 countries. Brendan Tierney, (Dublin, Ireland), Oracle ACE Director, has been working with the Oracle Database and development tools since 1992. He is principal consultant with Oralytics. He is the author of 2 books by Oracle Press, Predictive Analytics using Oracle Data Miner and Oracle R Enterprise: Harnessing the Power of R in the Oracle Database. Heli Helskyaho, (Helsinki, Finland), Oracle ACE Director, has been working in IT since 1990 and Oracle products since 1993. She is the spokesperson/ambassador of the EMEA Oracle User Group and a frequent speaker in many conferences. She is the author of Oracle SQL Developer Data Modeler for Database Design Mastery (Oracle Press 2015) and one of the first winners of Oracle Database Developer Choice Award in Database Design category in 2015. Alex Nuijten, (Oosterhout, Netherlands), Oracle ACE Director, is a consultant at Ordina Oracle Solutions. He is a frequent contributor to Oracle-related publications and is co-author of Oracle APEX Best Practices.